I must admit to not having looked forward to a single Danny Boyle film in recent years. I enjoyed his films that were more rough-cut, like Trainspotting,Shallow Grave and 28 Days Later, rather more than his more recent Slumdog Millionaire and 127 Hours, both of which seem too finely polished for my taste. Although he got rave reviews for his work at the London Olympics in 2012, again, it did not do anything for me. 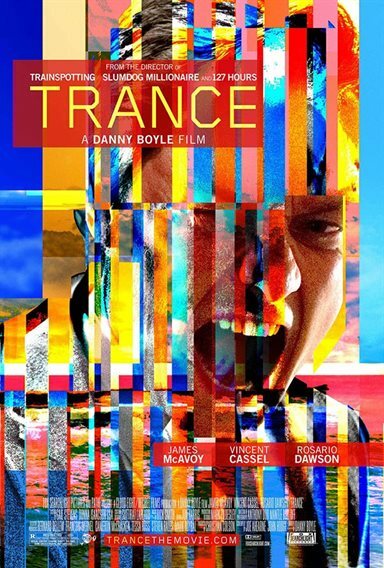 Not long after the Olympics, I got my first glimpses of the next Boyle movie, Trance, and I immediately took note. Firstly, it looked rather good, but secondly, and more importantly, it looked like a Boyle movie of yesteryear. Simon Newton (James McAvoy, Atonement, X-Men First Class) is a London art auctioneer who teams up with a bunch of art thieves headed by Franck (Vincent Cassel, Black Swan) with the intention of stealing a rather expensive painting. Things do not go quite according to plan, and would-be thief Simon turns out to be the would-be hero, as he tries to foil the robbery, receiving a nasty bump on the head which leads to an inconvenient temporary bout of amnesia — forgetting where he had hid the painting. Torture fails to extract the required memory, so hypnotist Elizabeth Lamb (Rosario Dawson, Sin City) is hired to try and delve into Simon's subconscious in an attempt to get him to remember just where he had hid the painting. The movie itself starts off a bit on the sluggish side, so much so that after the first 20 minutes or so I was actually trying to remember the last movie I had walked out of. But once past that initial phase things really kicked into life; in a way, it was like reading a book and getting to the most exciting part, anticipating the turn of the page for the next reveal. For when it came to a reveal, Boyle had the story twist, and then just when you got everything straight in your head once again, there was another twist turning everything upside-down, and inside-out for good measure. During the twistfest, though, you were slowly being drip-fed just enough information on the characters, developing them right up until the last scene, when the final twist reveals all and ties together all the loose ends. Rosario Dawson was very convincing as the Harley Street hypnotherapist. However, Vincent Cassel came across as too nice a guy to be a villain. Whether that was intentional or not who can say, but he left me feeling he was more of a father to McAvoy's Simon, rather than a ruthless criminal who thinks he's been duped by him. McAvoy in his second leading role to be hitting the big screen within a month — after Welcome to the Punch — seems to going from strength to strength, and 2013 could well be his year, although we will have to wait until September for the Scot's third lead in Filth. His portrayal of Simon as the charming, well-mannered young man with some rather dark secrets was the pick of the three. You have to hand it to Boyle for his directing prowess; the city landscapes were sublime, and his choice to shoot some scenes by tilting the camera a little gives the impression you are being pulled ever closer to the screen. When this is added to Rick Smith's soundtrack, which seemed to get louder the further into the film you went, complementing the movie perfectly, you really do get the feeling you are living in this movie. Even with my criticism of the first 20 minutes or so, for me Trance is a not-to-be-missed movie; it's stylish, intriguing and compelling, and worthy of a second viewing, one which I found even better than the first.